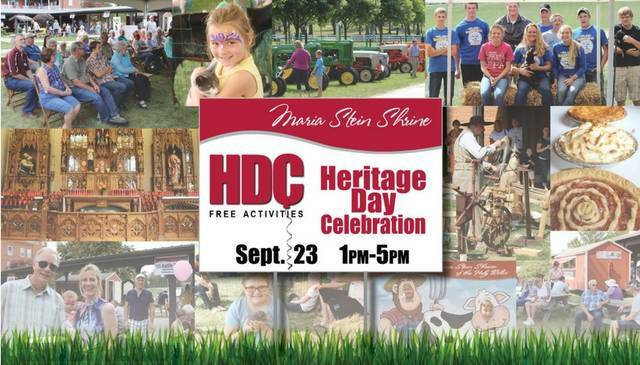 MARIA STEIN – The Maria Stein Shrine will host the third annual Heritage Day Celebration from 1-5 p.m. on Sept. 23. The family friendly event offers free activities including quilt and tractors shows, a juggler and weaver, youth games and crafts, Shrine scavenger hunt with prizes, pie baking contest and auction, gift basket raffle and Relic Chapel presentations. Free live music will be provided by Danny Schneible (1-3 p.m.) and Mike Koesters, Luke Fullenkamp and Keith Homan (3-5p.m.). Other activities include the popular Sweet Tooth Booth, balloon animals, face painting and ice cream. Romer’s chicken dinners are available (pre-sale only until Sept. 13) for $7 with pick up at the Shrine driveway 4-5:30 p.m. Burgers, sausage patties and hot dogs also are available at the event. Raffle tickets are on sale now at the Shrine and are also available the day of the event. A $1,000 grand prize winner will be drawn the day of the event and one $50 prize winner will be drawn weekly for 52 weeks. The Heritage Day Celebration is held each year to raise funds for the operation of the Maria Stein Shrine.